He stared at them through thick lenses distorting the size of his eyes. West Texas heat shimmered up from the ground, obscuring the face of every kid standing on the far side of the baseball diamond spray painted on the dirt. The white lines zigzagged in places where the finger depressing the nozzle of the paint can had grown tired. As he sized up the other players, he noticed there were several girls among them. One of them had her ball cap pulled so low she had to tip her head back to see out from underneath the brim. She blew a large pink bubble. Particles from a plume of dust kicked up by a sudden breeze stuck to the gum. She sucked it back into her mouth to resume chewing, crunching dirt and all. The boy looked too big for a twelve year-old. He knew how he appeared in the short, striped tee shirt revealing his soft brown belly and the glasses meant for a senior citizen. He figured it’s what kept them from motioning him to come over. But he didn’t have anything to prove to anyone. Most of them had seen what he could do with a ball and bat in gym class. Besides, none of them owned cleats let alone a real uniform with sponsorship from some local pizza shop emblazoned on the back of a bright orange or green shirt. There were no freshly pressed baseball pants among this crowd of imitators smacking their dented aluminum bats against the bottom of their Goodwill Nikes. Their gear consisted of worn out relics discarded from the Y. In this respect, they were all equal with the exception of one detail. He owned his own bat. It was the best part of him, an extension of his true self. With care he swabbed an alcohol-soaked cotton ball across the wood to remove excess dirt before massaging it with linseed oil. The treatment was stringent but soothing, not unlike his own personality. Every night he stored the bat handle side up in the cool, dry closet of his concrete block home. 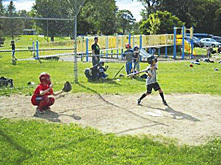 With confidence as solid as the maple bat he held in both hands, the boy walked over to where the bottom of a blue plastic milk crate marked home plate. He informed them in a voice as deep as a grown man’s that he would captain one team and didn’t care who led the other. Braced for their rejection, his shoulders relaxed when they nodded their reluctant agreement. Every kid stood taller, straighter, to ensure they were not chosen last. With nods and waves as subtle as those at an auction house, players were selected until they stood in a ragged group behind their respective captain. Each silently swore allegiance to their leader simply because no one wanted to be on the losing side. They would expend every ounce of energy to secure a victory regardless of who led them. Someone’s lucky Mercury head dime flashed in the air, tails was called, and the boy said his team would take the field. A few skeptical glances were cast in his direction, but he reassured them that if they were down in the ninth inning they would want to be last at bat. Not that he planned on being behind. With a touch of swagger, he left his precious bat in the care of the only girl in a dress as she sat on the swaybacked, wooden bleachers. Then he selected a glove and ball from the pile. He took the mound with authority, made eye contact with his first, second, and third basemen, nodded to the catcher, and caught the first batter off guard with his best four-seam fastball. When several members of the other team cheered as their own captain struck out, the boy knew he had made friends and enemies. He also knew he would be invited back if only for the sake of a rematch. That pleased him; bruised egos made for good opponents. He wished he had the money for a round of Slush Puppies. It would probably help to ease the sting of defeat. Since it wasn’t an option, he focused instead on earning their respect rather than buying it. « Saved by the… Beef? Fantastic story. I love that the boy knew he needed to earn respect rather than buy it. But, he is such a complex character to also wish he could treat the opposition to slushies. I think your stories are tremendous. They are homey, cosy and comforting. They have a redeaming and kind voice that seems to be lacking in so many stories and lives now. I read every post. Great lesson in growing up and earning respect as you said rather than buying it. Well written short story. My minds eye saw all the action as it unfolded. I could feel the emotions of the young man making new friends and enemies. Well done.